Chlorofluorocarbons (CFCs), known to deplete ozone, are also to blame for global warming since the 1970s, according to a paper in the International Journal of Modern Physics B. The statistical analysis found that CFCs are the key driver in global climate change, rather than carbon dioxide (CO2) emissions, which the author says would explain why temperature has not continued to rise as CO2 has - CFCs have gone down a lot. 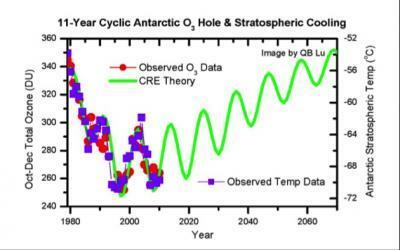 The findings are based on statistical analyses of observed data from 1850 up to the present time, the cosmic-ray-driven electron-reaction (CRE) hypothesis of ozone depletion by Professor Qing-Bin Lu, a professor of physics and astronomy, biology and chemistry in Waterloo's Faculty of Science, and his previous research into Antarctic ozone depletion and global surface temperatures. "Conventional thinking says that the emission of human-made non-CFC gases such as carbon dioxide has mainly contributed to global warming. But we have observed data going back to the Industrial Revolution that convincingly shows that conventional understanding is wrong," said Lu. "In fact, the data shows that CFCs conspiring with cosmic rays caused both the polar ozone hole and global warming. "Most conventional theories expect that global temperatures will continue to increase as CO2 levels continue to rise, as they have done since 1850. What's striking is that since 2002, global temperatures have actually declined – matching a decline in CFCs in the atmosphere. My calculations of CFC greenhouse effect show that there was global warming by about 0.6 °C from 1950 to 2002, but the earth has actually cooled since 2002. The cooling trend is set to continue for the next 50-70 years as the amount of CFCs in the atmosphere continues to decline." "It was generally accepted for more than two decades that the Earth's ozone layer was depleted by the sun's ultraviolet light-induced destruction of CFCs in the atmosphere," he said. "But in contrast, CRE theory says cosmic rays – energy particles originating in space – play the dominant role in breaking down ozone-depleting molecules and then ozone." Lu's theory has been confirmed by ongoing observations of cosmic ray, CFC, ozone and stratospheric temperature data over several 11-year solar cycles. "CRE is the only theory that provides us with an excellent reproduction of 11-year cyclic variations of both polar ozone loss and stratospheric cooling," said Professor Lu. "After removing the natural cosmic-ray effect, my new paper shows a pronounced recovery by ~20% of the Antarctic ozone hole, consistent with the decline of CFCs in the polar stratosphere." "The climate in the Antarctic stratosphere has been completely controlled by CFCs and cosmic rays, with no CO2 impact. The change in global surface temperature after the removal of the solar effect has shown zero correlation with CO2 but a nearly perfect linear correlation with CFCs - a correlation coefficient as high as 0.97." The analyses indicate the dominance of Lu's CRE theory and the success of the Montreal Protocol on Substances that Deplete the Ozone Layer. "We've known for some time that CFCs have a really damaging effect on our atmosphere and we've taken measures to reduce their emissions," Professor Lu said. "We now know that international efforts such as the Montreal Protocol have also had a profound effect on global warming but they must be placed on firmer scientific ground." "This study underlines the importance of understanding the basic science underlying ozone depletion and global climate change," said Terry McMahon, dean of the faculty of science. "This research is of particular importance not only to the research community, but to policy makers and the public alike as we look to the future of our climate." Lu's paper, "Cosmic-Ray-Driven Reaction and Greenhouse Effect of Halogenated Molecules: Culprits for Atmospheric Ozone Depletion and Global Climate Change", also predicts that the global sea level will continue to rise for some years as the hole in the ozone recovers increasing ice melting in the polar regions. "Only when the effect of the global temperature recovery dominates over that of the polar ozone hole recovery, will both temperature and polar ice melting drop concurrently," says Lu. "Conventional thinking says that the emission of human-made non-CFC gases such as carbon dioxide has mainly contributed to global warming. But we have observed data going back to the Industrial Revolution that convincingly shows that conventional understanding is wrong. 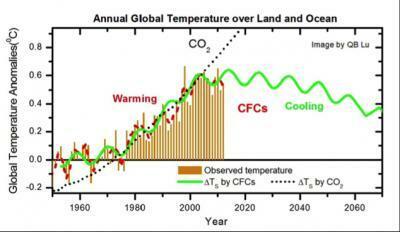 In fact, the data shows that CFCs conspiring with cosmic rays caused both the polar ozone hole and global warming."